Fielded March 6-12 as Americans were first learning about the American Health Care Act and before the Congressional Budget Office estimated its effects, the latest Kaiser Tracking Poll shows that large shares of the public expect the House Republican health care plan would result in fewer people having health insurance and higher costs for people who buy their own health insurance. Republicans are generally more likely to expect positive results from the plan while Democrats and independents are more likely to foresee negative ones. About half (48%) of the public say the plan would result in fewer people having health insurance, compared to one in five (18%) who say it would increase the number of people with coverage. Nearly half (45%) say protections for people with pre-existing conditions would stay about the same. 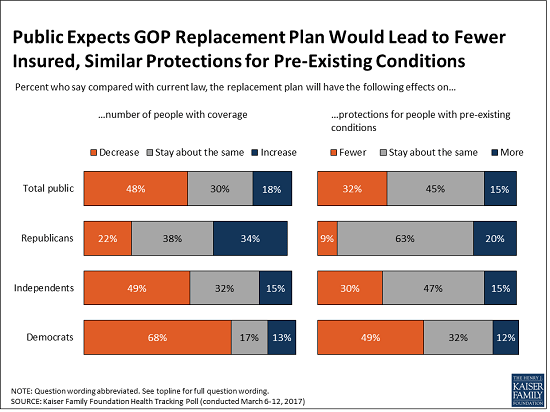 Roughly a third (32%) say the replacement plan would weaken protections for people with pre-existing conditions, about twice the share who say it would increase protections (15%). Nearly half (48%) expect the House plan to increase health costs for those who buy their own insurance compared to a quarter (23%) who expect it to lower their costs. Almost half (46%) of Republicans expect lower costs for this group, while most Democrats (71%) expect higher costs. More independents expect costs to increase (47%) than decrease (25%). More say it would increase deductibles (41%) than lower deductibles (25%), though Republicans are more likely to expect deductibles would decrease (41%) than increase (16%). At least four in 10 say they expect the plan to increase costs for younger people (41%), older people (45%), people with low incomes (46%), and people living in both urban (41%) and rural (42%) areas who buy their own insurance. Smaller shares expect it to decrease costs in each category. The public’s views are more evenly split on one group: people with higher incomes. Similar shares say this group would see lower costs (27%) as higher costs (25%). Overall, the public remains divided on whether Congress should (45%) or should not (51%) repeal the Affordable Care Act at all. Among those who favor repeal, more want Congress to wait until the details of a replacement plan are known (24% overall) than want an immediate vote (19%). Views of the Affordable Care Act overall are similar to last month, with 49 percent holding a favorable view and 44 percent unfavorable. As in the past, there are huge partisan divisions, with Democrats largely holding favorable views and Republicans largely holding unfavorable ones. The House replacement bill includes a provision that would prohibit federal funding for Planned Parenthood clinics for one year for all Medicaid services they provide, including contraception, testing and treatment for sexually transmitted diseases and cancer screenings. Three quarters (75%) of the public oppose cutting off federal funds to Planned Parenthood for providing these services, while 22 percent favor it. Substantial majorities of Democrats and independents as well as narrower majorities of Republican men (55%) and Republican women (57%) oppose cutting off funding. Relatively few people change their minds when presented with counterarguments to their initial view. At least two thirds of Americans also report being aware of the range of services Planned Parenthood provides, including contraception (87%), testing and treatment for sexually transmitted diseases (80%), cancer screenings and preventive services (68%), and abortion (68%). 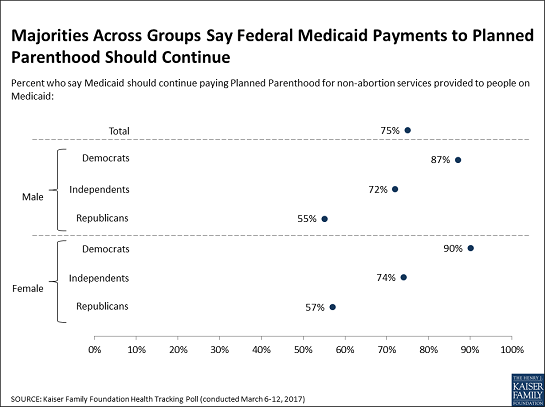 In contrast, about one third (33%) of the public is aware that there is already a ban on using federal Medicaid funds to pay for abortions. President Trump and Republican leaders in Congress have supported the idea of allowing insurers to sell their plans across state lines as a way to drive down insurance costs, though this provision is not included in the current House legislation. The poll finds two thirds of the public (64%) generally favor this provision, compared to about three in 10 (28%) who oppose it. However, substantial shares of those who support or oppose the provisions change their minds when presented with counterarguments. For instance, about half of those who originally supported the provision change to oppose it (bringing total opposition to 57%) after hearing that it could encourage insurers to operate from states with fewer consumer protections and make it harder for consumers to get help if they have a problem. Similarly, about four in 10 of those who initially opposed the provision switch to support it (bringing total support to 78%) after hearing it could encourage competition and decrease costs for consumers. Designed and analyzed by public opinion researchers at the Kaiser Family Foundation, the poll was conducted from March 6-12 among a nationally representative random digit dial telephone sample of 1,206 adults. Interviews were conducted in English and Spanish by landline (421) and cell phone (785). The margin of sampling error is plus or minus 3 percentage points for the full sample. For results based on subgroups, the margin of sampling error may be higher.